An amazing testimony is shared in God Adventure church, East London on Easter Sunday. From the left are Corne Pretorius, senior leader of God Adventure, Daniel Nass, and Carlos Padilla. It was a case of what the enemy meant for harm, God used for good, when a recent road accident in East London led to the salvation of the driver on the street, and healing miracles and 75 salvations at a local hospital. The amazing chain of events began when students from the Bethel School of Supernatural Ministry (BSSM) in California, were leading a power evangelism outreach in a city suburb. 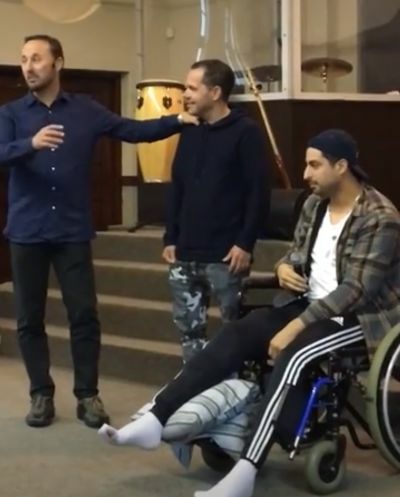 There had been some salvations and healing miracles on the street when disaster suddenly struck — one of the students, Carlos Padilla, was run over by a car and his leg was badly broken, said Corne Pretorius, senior leader of God Adventure, the church that was hosting the students. But then the drama began to take some very unexpected turns. The driver of the car, Daniel Nass picks up the story: “I was on my way home from work on Monday 3rd April when my amazing adventure started. “I had just driven around the traffic circle into Queen Street in Cambridge when, before I had any chance to take evasive action, I knocked Carlos Padilla over. “Carlos was there spreading the word of God with friends from his ministry school in Bethel. Initially everything just happened in slow motion. I saw Carlos bounce off my windscreen and land on the street next to my car. I thought surely he was dead or at least critically injured. “I got out the car trying to avoid looking at what had just transpired. I went and sat on my back bumper, and as the reality of what had happened starting sinking in, I started getting really bad chest pains. “Anthony, a pastor at God Adventure saw me. came over to me and prayed for me, and immediately the chest pains began to subside. “I realised I had to go and see how Carlos was and tell him how sorry I was. When I first saw him, I had to take a second look at his legs to make sure this was the guy I had just bumped with my car. Pretorius filled in further details of the story: “Carlos was rushed by ambulance through to emergency at Life St Dominic’s hospital, accompanied by a few team members from BSSM and God Adventure. “Carlos reassured the team not to worry about him but rather pray and show the love of Jesus to others in the ER. “While he was being attended to, the team started sharing the goodness of God and praying for people in need of healing. One woman had a broken ankle. She was in a wheelchair. The team prayed for her and she immediately got up and started walking around, pain free! “People were so impacted by what they witnessed that at least 12 people gave their lives to Jesus right there on the spot and others testified of pain leaving their bodies as the team prayed for them. “The next day a God Adventure pastor bumped into the woman with the ‘broken ankle’ in the hospital. She told him that she had been back to see the doctor and he had said he must have made a mistake, there was nothing wrong with her ankle! “While Carlos was in hospital for 10 days recovering, he saw 75 people give their lives to Jesus and many healed. Patients, nurses, orderlies and others were queuing at his bedside for prayer after the news spread and hearing testimonies of those who received healing. “His testimonies on Facebook are going viral with over 12k hits! One such testimony involved him interviewing a nurse and an orderly. The orderly describes how when Carlos prayed for pain in his wrist, it went immediately. The nurse describes how he called out a word of knowledge for pain in her back and she was healed! “On another occasion, a nurse woke him up at 3am to pray for her and her nephew. The adventure with God also impacted Daniel Nass’s family. 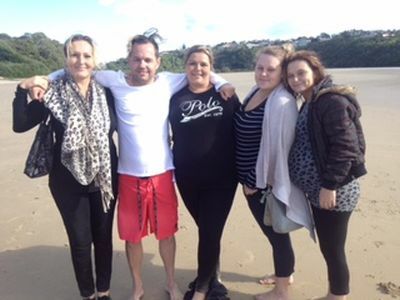 Nass, along with five members of his family who were all radically moved by his testimony and the change in his life, were all baptised in the Nahoon River on Good Friday, said Pretorius. “They are now attending God Adventure,” he said. Referring to the road accident that struck during the evangelism outreach, Pretorius said: “The devil didn’t know what was coming his way and once again he overplayed his hand. God is alive!! Allelulia!! What an awesome God we serve… go God Adventure .. keep spreading His love and hope and may His Kingdom come! GOD’S NOT DEAD HE’S SURELY ALIVE!!! So many healed, so many miracles out of this “accident”…thank you Jesus!! God Bless you Carlos and all others of God’s Adventure from PCC in Winnipeg, Manitoba Canada!!! Jesus is good and willing! !